The role of the redox adaptor protein p66Shc as a potential mediator of saturated fatty acid (FA)-induced beta cell death was investigated. The effects of the FA palmitate on p66Shc expression were evaluated in human and murine islets and in rat insulin-secreting INS-1E cells. p66Shc expression was also measured in islets from mice fed a high-fat diet (HFD) and from human donors with different BMIs. Cell apoptosis was quantified by two independent assays. The role of p66Shc was investigated using pancreatic islets from p66 Shc−/− mice and in INS-1E cells with knockdown of p66Shc or overexpression of wild-type and phosphorylation-defective p66Shc. Production of reactive oxygen species (ROS) was evaluated by the dihydroethidium oxidation method. Palmitate induced a selective increase in p66Shc protein expression and phosphorylation on Ser36 and augmented apoptosis in human and mouse islets and in INS-1E cells. Inhibiting the tumour suppressor protein p53 prevented both the palmitate-induced increase in p66Shc expression and beta cell apoptosis. Palmitate-induced apoptosis was abrogated in islets from p66 Shc−/− mice and following p66 Shc knockdown in INS-1E cells; by contrast, overexpression of p66Shc, but not that of the phosphorylation-defective p66Shc mutant, enhanced palmitate-induced apoptosis. The pro-apoptotic effects of p66Shc were dependent upon its c-Jun N-terminal kinase-mediated phosphorylation on Ser36 and associated with generation of ROS. p66Shc protein expression and function were also elevated in islets from HFD-fed mice and from obese/overweight cadaveric human donors. p53-dependent augmentation of p66Shc expression and function represents a key signalling response contributing to beta cell apoptosis under conditions of lipotoxicity. Annalisa Natalicchio and Federica Tortosa contributed equally to this work. The online version of this article (doi: 10.1007/s00125-015-3563-2) contains peer-reviewed but unedited supplementary material, which is available to authorised users. An erratum to this article can be found at http://dx.doi.org/10.1007/s00125-015-3739-9. 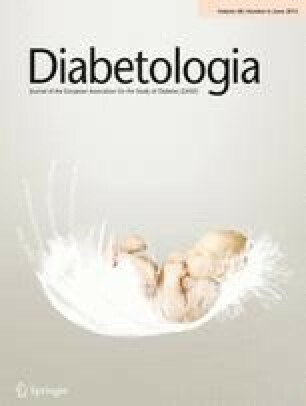 Saturated fatty acid (FA)-induced apoptosis of pancreatic beta cells has long been recognised as a major mechanism linking excess dietary fat and beta cell damage, leading to impaired insulin secretion and hyperglycaemia in type 2 diabetes, particularly when associated with visceral obesity [1, 2, 3]. FA-induced beta cell apoptosis involves a variety of signalling mechanisms, including endoplasmic reticulum (ER) stress induction , mitochondrial dysfunction , activation of specific intracellular kinases such as the members of the mitogen-activated protein kinase (MAPK) family c-Jun N-terminal kinase (JNK) and p38 MAPK [6, 7] and protein kinase C (PKC)δ , and peroxisome-generated reactive oxygen species (ROS) [7, 9]. The tumour suppressor protein p53 is also implicated in FA-induced beta cell apoptosis [7, 10], since both palmitate and oleate were shown to stimulate apoptosis of NIT-1 beta cells through p53 , and p53 inhibition was found to be involved in growth factor-dependent promotion of beta cell survival via Akt/protein kinase B . However, p53 signalling in the context of beta cell lipotoxicity is still poorly defined. p66Shc, a 66 kDa proto-oncogene Src collagen homologue (Shc) adaptor protein, is the largest of three protein isoforms (p66Shc, p52Shc and p46Shc) encoded by the Shc gene [11, 12]. p66Shc possesses specific functions, such as modulation of p46/52Shc complex activation and downstream signalling via MAPK kinase (MEK)–extracellular signal-regulated kinase (ERK) [13, 14, 15, 16] and control of actin cytoskeleton turnover and glucose transport [16, 17]. Importantly, p66Shc is implicated in both sensing and activation of cellular oxidative stress and consequent induction of apoptosis . p66Shc signalling is strictly dependent upon phosphorylation of Ser36 in the protein CH2 domain, triggered by cell exposure to oxidative stress-inducing agents . Recently, p66 Shc knockout mice were found to exhibit protection from hyperglycaemia-induced microvascular disease  and from development of diabetic autonomic neuropathy . Levels of p66 Shc mRNA and p66Shc protein were found to be increased in the kidney cortex of diabetic mice  and in circulating leucocytes from diabetic patients , suggesting that p66Shc could ‘sense’ the impaired metabolic milieu in diabetes and promote cellular dysfunction. In support of this concept, the p66Shc protein was found to act as a downstream effector of the tumour suppressor p53 gene in oxidative stress-induced apoptosis [18, 22], and a p53 response element in the gene promoter of p66 Shc has also been identified . On the other hand, FAs increase the level of p53 acetylation in human monocytes . Therefore, we investigated the involvement of p53 and p66Shc in FA-dependent apoptosis in pancreatic beta cells. Animals were kept in an animal house under controlled temperature, humidity and lighting. Animal experimentation respecting the regulations of Italy and the EU were conducted with the approval of the ethics committee (CESA) of the Gaetano Salvatore Research Institute (IRGS), Biogem, Italy (internal ID 0907), in accordance with the National Institutes of Health (NIH) Principles of Laboratory Animal Care (NIH publication no. 85-23, revised 1985). Wild-type (WT) C57Bl/6 mice were purchased from Charles River Laboratories (Calco, Italy). p66 Shc−/− mice were on matched C57Bl/6 genetic backgrounds. Generation of p66 Shc−/− mice has been previously described . From weaning at the age of 3 weeks onwards, mice received a standard diet. At the age of 3 weeks, mice were randomised to a high-fat diet (HFD; purchased from Mucedola (Settimio Milanese, Milan, Italy) and consisting of 60% fat from palm oil) or continued on a standard diet for an additional 21 days. Blood samples were collected from the tail vein of fed mice. Mouse islets were isolated by bile duct perfusion and collagenase digestion and maintained in culture, as previously described . After isolation, islets were studied within 3 days. Human pancreatic islets were isolated from nine lean and 13 overweight/obese cadaveric donors (electronic supplementary material [ESM] Table 1). Pancreases were excised and processed with the approval of the regional ethics committee. Islets were obtained and cultured, as previously reported [26, 27], and studied within 3 days from isolation. Cell viability in islets, measured by Trypan Blue exclusion, was higher than 90% after 3 days in culture. Rat insulin-secreting INS-1E cells (passage 15-30; a kind gift from C. B. Wollheim, University of Geneva, Switzerland) were grown and treated with or without 0.5 mmol/l palmitic acid (Sigma-Aldrich, St Louis, MO, USA), as previously reported [6, 28]. All chemical inhibitors were provided by Calbiochem (Darmstadt, Germany). Exendin-4 (exenatide) was obtained from Ely Lilly (Indianapolis, IN, USA). Generation of an adenoviral construct encoding for the p66Shc protein and transfection of INS-1E cells with recombinant adenoviruses were carried out according to previously reported procedures . INS-1E cells were also transfected with an adenoviral p66Shc construct carrying a Ser36 to Ala36 mutation, as indicated. An empty adenovirus was used as control for the infection (‘mock’). INS-1E cells grown to 70% confluence were transiently transfected with p66 Shc short, interfering RNA (siRNA) 1 or p66 Shc siRNA 2 (Qiagen, Hilden, Germany) or with p53 siRNA (s128540; Life Technologies, Carlsbad, CA, USA). See ESM Methods for further details. RNA isolation and cDNA synthesis were conducted as previously described [6, 27]. Primers were designed using Primer Express version 3.0 (Life Technologies, Carlsbad, CA, USA) and purchased from Life Technologies. Primer sequences are reported in ESM Table 2. See ESM Methods for further details. Cells lysates were obtained and analysed by immunoblotting, as previously described . A list of the antibodies used is shown in ESM Table 3. See ESM Methods for further details. Apoptosis was measured by evaluating mono- and oligonucleosomes in the cytoplasmic fraction of cell lysates, by annexin V allophycocyanin (APC) labelling or by TUNEL assay. See ESM Methods for further details. Intracellular ROS were detected through the evaluation of dihydroethidium (DHE) oxidation. See ESM Methods for further details. All data are presented as means ± SEM. Statistical analysis was performed using the two-tailed unpaired Student’s t test or ANOVA, followed by the Tukey multiple comparison test, as appropriate. Statistical significance was set at p < 0.05. Exposure of isolated murine islets to palmitic acid (palmitate, 0.5 mmol/l) for up 24 h resulted in a ~2.5-fold increase in p66 Shc mRNA and protein at 16 and 24 h (p < 0.05; Fig. 1a, c) without changing the expression of p46Shc and p52Shc, the other Shc protein isoforms (ESM Fig. 1a). Similarly, challenge with palmitate for 24 h increased p66Shc protein content in human pancreatic islets (p < 0.05; Fig. 1d). Palmitate selectively augmented p66 Shc mRNA and protein expression approximately threefold also in rat insulinoma INS-1E cells (p < 0.05; Fig. 1b and ESM Fig. 1b), confirming the ability of this saturated FA to increase p66Shc expression in pancreatic beta cells. p66Shc protein content in murine islets and rat INS-1E cells was not influenced by BSA in the culture medium (ESM Fig. 2a, b). Furthermore, an increase in p66Shc phosphorylation on Ser36 was found in all experimental cell systems exposed to palmitate (p < 0.05; Fig. 1c–e), largely in consequence of augmented protein content, since the ratio of phosphorylated to total p66Shc was unchanged (ESM Fig. 1c). Exposure of INS-1E cells to the unsaturated FA oleate (0.5 mmol/l) for up 48 h also resulted in an approximately twofold increase in p66Shc protein and Ser36 phosphorylation (p < 0.05; ESM Fig. 3a). Exposure of INS-1E cells to palmitate raised the proportion of apoptotic cells from 1.7% to 13.4% (p < 0.05; ESM Fig. 4). Transfection of INS-1E cells with two independent siRNAs resulted in a 55–80% reduction in p66Shc protein levels compared with control (p < 0.05; Fig. 2a), and prevented the palmitate-induced increase in p66Shc expression/phosphorylation on Ser36 and apoptosis (p < 0.05; Fig. 2b, c). Furthermore, the increased apoptosis in response to excess FAs was completely abrogated in islets from p66 Shc−/− C57Bl/6 mice (Fig. 2e), in which p66Shc protein levels were reduced by 90% and did not change following palmitate treatment (p < 0.05; Fig. 2d). On the other hand, INS-1E cells infected with recombinant adenovirus overexpressing p66Shc (Ad/p66 Shc ) showed a fourfold augmentation of p66Shc protein levels (p < 0.05; Fig. 3a) and enhancement of both basal and palmitate-stimulated p66Shc Ser36 phosphorylation and apoptosis compared with non-infected (WT) and mock-infected (Ad/mock) control cells (p < 0.05; Fig. 3b–d). The lowest adenovirus dose was used (i.e. 40 plaque-forming units [PFU]/ml), which resulted in a fourfold increase in p66Shc protein content (p < 0.05; Fig. 3a) while maintaining normal cellular morphology (data not shown). Increased p66Shc protein expression, even in the absence of palmitate, resulted in dose-dependent augmentation of cell apoptosis (p < 0.05; ESM Fig. 5). Altogether, these results demonstrate that the p66Shc protein plays an essential role in FA-mediated apoptotic beta cell death. The effects of other apoptotic agents, such as high glucose, were also investigated. INS-1E cells challenged with 25 mmol/l glucose levels for up 24 h showed selective augmentation of p66Shc protein levels and Ser36 phosphorylation by ~2.5-fold, as well as increased apoptosis (p < 0.05; ESM Fig. 3c, d). Overexpression of p66Shc enhanced both basal and glucose-stimulated apoptosis compared with control (p < 0.05; ESM Fig. 6a). On the other hand, siRNA-mediated reduction of p66Shc protein levels resulted in partial inhibition of glucose-induced apoptosis by approximately 50% (p < 0.05; ESM Fig. 6b). These results show that p66Shc contributes to beta cell apoptosis induced by high glucose. p66Shc has reportedly been shown to act as a downstream effector of p53 in stress-induced apoptosis . Treatment of both INS-1E cells and isolated murine islets with palmitate induced a 2.5-fold increase in p53 mRNA and protein levels (p < 0.05; Fig. 4a, b and data not shown). When INS-1E cells were pretreated with pifithrin-α, an inhibitor of the p53 protein, the palmitate-induced increase in p53 and p66Shc expression was completely abrogated (p < 0.05; Fig. 4c) and so was palmitate-induced apoptosis (p < 0.05; Fig. 4d). Reduced palmitate-induced p66Shc expression and apoptosis were similarly observed when p53 protein expression was inhibited using a specific siRNA (p < 0.05; Fig. 4e, f). Thus, p53 mediates the palmitate-induced upregulation of p66Shc and the resulting pro-apoptotic response in insulin-secreting cells. To investigate the role of p66Shc Ser36 phosphorylation, a key event in p66Shc signalling , in FA-triggered beta cell apoptosis, a mutant p66Shc protein, in which Ser36 was replaced by Ala, was overexpressed approximately threefold in INS-1E cells (Ad/p66 Shc Ala 36 ), reaching levels similar to those obtained after palmitate treatment (Fig. 5a). In Ad/p66 Shc Ala 36 cells, basal p66Shc phosphorylation was similar to control Ad/mock cells and reduced compared with Ad/p66 Shc cells, whereas palmitate-stimulated phosphorylation was reduced compared with both Ad/p66 Shc and Ad/mock cells (p < 0.05; Fig. 5a), consistent with the phosphorylation-defective trait of the overexpressed p66Shc mutant likely acting as a dominant-negative protein. Accordingly, the rates of cellular apoptosis were reduced in Ad/p66 Shc Ala 36 compared with Ad/p66 Shc cells under basal conditions (p < 0.05; Fig. 5b, c), and reduced compared with both Ad/p66 Shc and Ad/mock cells following exposure to palmitate (p < 0.05; Fig. 5b, c), strictly correlating with the level of Ser36 phosphorylation of p66Shc. Thus, Ser36 phosphorylation of p66Shc is essential for its ability to mediate the pro-apoptotic effects of palmitate. Similar results were observed in INS-1E cells challenged with high glucose (ESM Fig. 6a). Studies with specific JNK, ERK and p38 MAPK inhibitors demonstrated that the stress-activated kinase JNK, but not ERK or p38 MAPK, is involved in the ability of palmitate to stimulate p66Shc phosphorylation on Ser36 and the resulting pro-apoptotic response in INS-1E cells. In both Ad/mock and Ad/p66 Shc INS-1E cells, pretreatment with the JNK inhibitor SP600125, but not with the MEK-1/2 inhibitor PD98059 or the p38 MAPK inhibitor SB203680 (ESM Fig. 7a, b), effectively prevented palmitate-stimulated JNK phosphorylation (data not shown) as well as p66Shc phosphorylation on Ser36 (p < 0.05; Fig. 6a) and apoptosis (p < 0.05; Fig. 6b). Interestingly, glucagon-like peptide 1 (GLP-1) receptor agonists, which reportedly inhibit palmitate-induced apoptosis by preventing JNK phosphorylation , also inhibited p66Shc phosphorylation on Ser36. Pretreatment of Ad/mock cells with 10 nmol/l exendin-4 for 16 h resulted in abrogation of palmitate-induced Ser36 phosphorylation of p66Shc (p < 0.05; Fig. 6c). Thus, JNK-mediated-p66Shc phosphorylation on Ser36 is a key signalling node in the effects of palmitate on beta cell apoptosis. ROS-dependent oxidation of DHE was then measured in INS-1E cells overexpressing the WT or mutant p66Shc protein, both under basal conditions and following palmitate exposure. ROS levels were found to correlate with the level of p66Shc phosphorylation on Ser36, since they were increased in Ad/p66 Shc but not in Ad/p66 Shc Ala 36 cells, compared with control cells, and showed a further increase in response to palmitate (p < 0.05; Fig. 7a, b). In addition, pretreatment of INS-1E cells with the antioxidant N-acetyl-L-cysteine (NAC) resulted in significant inhibition of palmitate-induced augmentation of ROS levels (p < 0.05; Fig. 7c) and apoptosis (p < 0.05; Fig. 7d). Furthermore, NAC could largely inhibit the increased levels of apoptosis found in Ad/p66 Shc cells, whereas it was without effect in cells with p66Shc knockdown (Fig. 7e, f). Altogether, these findings show that ROS generation contributes to p66Shc-induced apoptosis in the context of lipotoxicity. Finally, islet expression of p66 Shc was investigated in vivo. In HFD-fed mice, serum triacylglycerol levels were higher than those in mice fed a standard diet (1.64 ± 0.17 vs 1.06 ± 0.29 mmol/l; p < 0.05), and p66 Shc mRNA levels in the pancreatic islets were augmented approximately twofold compared with controls (p < 0.05; Fig. 8a). The mRNA levels of p66 Shc were also increased several-fold in pancreatic islets from human donors with BMI >24.9 kg/m2 compared with donors with BMI ≤24.9 kg/m2 (p < 0.05; Fig. 8c), and this was associated with an elevation in p53 mRNA levels (p < 0.05; Fig. 8b). Intriguingly, islets from obese donors showed twofold higher mRNA levels of BAX (encoding BCL2-associated X protein), 2.4-fold higher mRNA levels of CASP3 (encoding caspase 3) and 2.9-fold higher mRNA levels of CYCS (encoding cytochrome c somatic) compared with non-obese donors (p < 0.05; Fig. 8d), suggesting greater activation of the pro-apoptotic response. Thus, conditions with high mobilisation of FAs are associated with augmentation of p66 Shc expression in pancreatic islets in vivo. Dysfunction of beta cells in type 2 diabetes may be further exacerbated in states with elevated plasma FAs [29, 30]. In this study, we show for the first time that p66Shc, an important redox sensor and pro-apoptotic member of the Shc protein family of molecular adaptors, is implicated in the negative effects of FAs on pancreatic beta cells. Accumulating evidence suggests that palmitic acid, a saturated FA, plays an important role in beta cell death [31, 32]. Prolonged exposure of beta cells to elevated palmitate concentrations has been shown to cause downstream JNK activation and increased p53 expression, events which are in part mediated by enhanced oxidative stress and typically linked to cellular damage [7, 24, 33, this study]. The identification of a p53 response/binding element in the promoter region of p66 Shc indicated that p66 Shc is a p53 target gene and that p66 Shc is indispensable for p53-induced apoptosis [22, 23, 34]. In this study, murine and human islets, as well as INS-1E cells, showed increased levels of p66Shc when chronically exposed to elevated palmitate concentrations. Moreover, pancreatic islets isolated from HFD-fed mice displayed robust increases in p66 Shc mRNA expression, establishing a link between in vivo lipotoxicity and p66 Shc regulation. Both the use of pifithrin-α, an inhibitor of p53 function, and siRNA-mediated p53 knockdown allowed us to prove that the ability of saturated FAs to promote p66Shc expression is mediated by p53, in line with similar results in other cell systems . We found that p53 expression was increased in response to palmitate in both mouse islets and INS-1E beta cells, as well as in human islets from overweight/obese compared with normal-weight donors. Beta cell challenge with palmitate resulted in enhanced p66 Shc mRNA and protein expression as well as phosphorylation of this protein on Ser36, a well-characterised pro-apoptotic event [18, 35, 36]. By using multiple approaches, i.e. siRNA-mediated p66 Shc gene silencing, use of islets from p66 Shc−/− mice and forced expression of p66Shc in INS-1E cells, the palmitate-triggered apoptosis was shown to require p66Shc. In mouse embryo fibroblasts  and vascular cells , targeted p66 Shc gene deletion conferred protection against apoptosis in response to oxidative stress and HFD, respectively. Furthermore, our results show that p66Shc also has a role in beta cell glucotoxicity, since high glucose increased p66Shc protein expression and its Ser36 phosphorylation, and manipulations of p66Shc content affected high glucose-induced beta cell apoptosis. However, p66Shc knockdown resulted in apparently slightly greater inhibition of apoptosis induced by palmitate than by high glucose (compare Fig. 2 and ESM Fig. 6). Ser36 phosphorylation of p66Shc is critical for inducing the apoptotic cascade in cells exposed to several toxic stimuli . Accordingly, in this study, overexpression of a phosphorylation-defective p66Shc mutant protein in INS-1E cells did not affect basal and reduced palmitate-induced apoptosis, respectively. Depending on the cellular context and stimulus, Ser36 phosphorylation of p66Shc was found to be promoted by either the MAP kinases ERK-1/2 or the stress-activated kinases JNK and p38 MAPK [14, 15, 35, 38, 39, 40, 41, 42]. In specific cells, it was shown to be mediated by PKCβ activation [43, 44, 45]. We found that p66Shc phosphorylation was prevented by pretreatment of cells with the specific JNK inhibitor, as in other cell types [36, 39, 42, 46]. Interestingly, the GLP-1 analogue exendin-4, which reportedly prevents FA-induced apoptosis by inhibiting JNK phosphorylation , markedly inhibited p66Shc phosphorylation on Ser36, linking GLP-1 receptor-dependent anti-apoptotic signalling to inhibition of JNK-mediated phosphorylation of p66Shc. Within mitochondria, the p66Shc protein binds cytochrome c and acts as an oxidoreductase, shuttling electrons from cytochrome c to molecular oxygen . This redox activity of p66Shc explains the increase in ROS levels caused by p66Shc overexpression, as well as their decrease in p66Shc knockout cells . Similarly, in beta cells, ROS levels were increased in Ad/p66 Shc cells and further augmented in response to palmitate, in close association with the levels of p66Shc phosphorylation on Ser36; moreover, the antioxidant NAC reduced apoptosis both in control and Ad/p66 Shc cells, whereas it was without effect in cells with p66 Shc knockdown. Altogether, these results suggest that the p66Shc-mediated ROS generation contributed to palmitate-induced apoptosis also in beta cells. Additional mechanisms could, however, be involved, including inhibition of beta cell survival signals. Indeed, overexpression of p66Shc was found to reduce both basal and insulin-stimulated Akt phosphorylation in INS-1E cells (Natalicchio et al, data not shown). We show that increased p66Shc expression levels in the pancreatic islets can also be observed in vivo, in response to HFD in mice and in association with overweight and non-diabetic obesity in humans. In the islets from obese donors, elevated p66 Shc mRNA levels were associated with enhanced expression of p53 and pro-apoptotic genes. Increased beta cell apoptosis has been reported in obese individuals, particularly those with type 2 diabetes . Of note, increased p66Shc levels have been reported in the aorta, kidneys and stem cells of experimental models of diabetes in vivo, as well as in circulating leucocytes from diabetic patients [19, 20, 21, 45, 50]. In summary, this study identifies p66Shc as a novel signalling intermediate in FA-mediated apoptotic beta cell damage. Targeting p66Shc in beta cells in vivo may potentially represent a novel strategy to prevent the deleterious effects of lipotoxicity on glucose control. We thank M. Gigante (University of Bari Aldo Moro, Bari, Italy) for assistance with the annexin V assays. This work was supported by Ministero dell’Università e della Ricerca, Italy, PRIN 2007 #200775N24E_004 (FG), PRIN 2010-2011 #2010JS3PMZ_010 (AN) and PRIN 2010-2011 #2010JS3PMZ_004 (PM). FG has received grant support from Eli Lilly, AstraZeneca, Sanofi and Lifescan, and lecture fees from Eli Lilly, AstraZeneca, Sanofi, Lifescan, Novo Nordisk, Boehringer Ingelheim, Takeda and Janssen. AA is a consultant for and has received lecture fees and grant support from Eli Lilly, Novo Nordisk, Servier, Sanofi, AstraZeneca, Bristol-Myers Squibb, Boehringer Ingelheim, Mediolanum, Takeda and Janssen. AN, FT, RL, GB, NM, EC, AL, AC, MB, PM, GPF, MG, SP, and LL have nothing to declare. All authors contributed to the conception and design of the study or to the analysis and interpretation of data, and to drafting the article or revising it critically for intellectual content. All authors have given their final approval of the version to be published. FG is the guarantor of this work.